Even by Brazilian standards, the Madeira River is impressive. From source to mouth it stretches more than 1,000 miles, the distance from London to Belgrade. 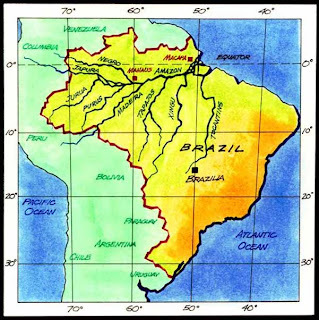 The largest of all the Amazon’s tributaries, it is also responsible for half of all the sediment transported by the river system to the Atlantic Ocean. Now Brazil’s authorities want to dam it. The Rio Madeira Dam Complex is earmarked as an Initiative for the Integration of Regional Infrastructure in South America, a high-profile scheme promoted by the Inter-American Development Bank. The project will include the construction of three hydroelectric dams, with the possibility of a fourth across the border in Bolivia. Brazil derives four-fifths of its power from its extensive dam system, making it the world’s third largest hydroelectricity producer. As well as adding to the national grid, the Rio Madeira project is being pitched as a 4,200 kilometre industrial waterway. Once operational, barges carrying soya, timber and minerals from the Amazon region will have quicker access to the Atlantic and Pacific coasts. Opponents of the $10.5 billion project have become more vocal in recent months as public tenders for the dam’s construction and management near. Environment groups such as the California-based International Rivers Network stress the damage the dams could do to the river’s unique biodiversity. The proposed flooding of 529 square kilometres will also require the forced relocation of about 3,000 riverbank dwellers and indigenous people. The usual string of email appeals and press denouncements has followed. Now campaigners are shifting strategy. Two not-for-profit organisations – Friends of the Earth in Brazil and the Netherlands-based Bank Track – are focusing on the project’s potential partners. In October, they issued a joint report entitled “Complex Project, Mega Risk”. Written with financial risk analysts in mind, it makes for an unorthodox protest document. The language has the ring of a credit agency or investment consultancy rather than a campaign group. The extensive list of identified risks includes dissonant budgets, judicial queries about the environmental licence, technical concerns, tender disputes and potential construction problems. Financial structure risks for insurers and reinsurers could also be prevalent should Brazil’s state-run National Bank for Economic and Social Development finance the majority of the project (as is expected) and thereby render all other debt deals subordinate. The Brazilian government is set to announce the project sponsors after an auction at the end of November. If using the logic and the language of the market is shown to work, a more mature form of dialogue between campaign groups and private sector could be in the offing. If not, the report’s appendix contains a long list of old-school activist groups that are more than ready to kick and scream.